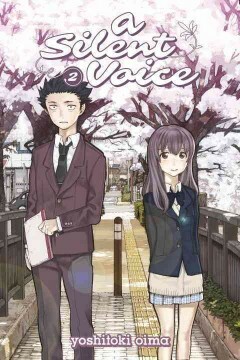 In a Silent Voice has been one of the best stories I have ever read base upon disability. This series treats the subjects of disability and bullying with complexity, and has rounded characters that have to overcome a variety of personal struggles in order to grow as people. This growth is realistically portrayed as messy and ugly, but these struggles allow the characters to be better people. It’s at times difficult witness the characters labors and mistakes, but this difficulty is what makes the moments of sadness or joy so much more poignant. This sense of realism also adds to the strong emotions portrayed by the series and makes it impactful. In a Silent Voice is a work that is not about giving easy answers, but rather having characters realistically overcoming their flaws. The story revolves around the main character Shoya Ishida who mercilessly bullies deaf student Shoko Nishimiya in elementary school causing her to transfer schools. It turns out however, that his friends turn against him and then bully him. Through these experiences and growing up he feels extremely guilty about his previous actions, and then ends up feeling depressed, that he deserves the abuse he now receives and closes himself off to others. Later he runs into Shoya once again, and decides he must do his best to apologize and to repent for his previous actions. The story is fascinating because it focuses on both Shoya’s and Shoko’s journey to open up about their pain, make amends with family, and reunite former and new friends which is a struggle. 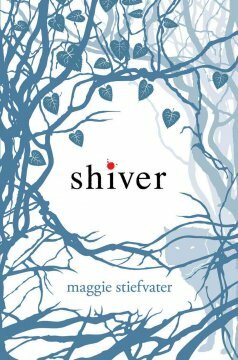 The story doesn’t pull punches, and includes the difficult topics of bullying, disability, ableism, guilt, depression, anger, and jealousy in frank ways without easy answers. Forgiveness is not earned easily and conflict is often a central theme of the story. It is this difficult realism though that allows the characters to better themselves, which as a reader allows you to better to understand them as humanly rounded and flawed which makes their change so meaningful. Weregirl is a book I desperately wanted to love, but just couldn’t. I have a soft spot for supernatural fiction, particularly fiction that focuses on werewolves and was hoping this story would be enjoyable. Sadly I really didn’t enjoy it despite its subject matter. The book has a number of problems, including poor pacing and plot, but I feel the biggest issue with this book has to do with its characterization and characters. This central issue not only harms the book as a whole, but also made the text’s other flaws even more noticeable. The major aspects lacking in the book could be summed up with the famous phrase “Show don’t tell.” Rarely does Weregirl explore inner thoughts or monologues of the characters, and even when it does it often lacks detail. This lack of interiority pulled me out of the story, and made it impossible for me to be invested in the characters. This was a huge issue, because many of the characters especially the supporting ones fell into weak character writing tropes including being plot devices, representing stereotypes, and lacking depth. Nessa’s friend Bree seemed only to exist to be her helpful friend, Billy and his mother only exist to be victims, the shaman ended up as the tough wise native mentor stereotype, and the corporations and medical team only seemed to exist as a cliché one dimensional evil. Even main character Nessa often lacked personality, particularly in her human state. Even after becoming a werewolf it takes death to make her serious about her role in the story, with a majority of the story and her energy focused on her track running. She does have some moments of setbacks such as injury, and also does show some agency when breaking up with a boyfriend, but primarily the human parts of the story consist of her using her wolf superpowers to win running scholarships and races without direct consequence. Even in the wolf based segments there is a noticeable lack of internalized thoughts, with many sequence describing what she does or how she feels, instead of what those feeling and actions mean to her. These aspects made the conflicts feel shallow, even when it should be at its fullest, because as a reader I was not given any investment in the characters including the lead. This in turn highlighted the other issues with the book, as there was no character to get attached. If you are looking for a better werewolf book I would recommend trying the The Wolves of Mercy Falls or Blood and Chocolate instead. Dairy of a Tokyo Teen is a great book for learning about Japan, especially for teenagers. 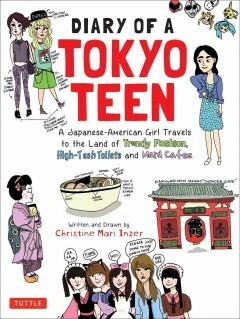 Written through the eyes of Christine Mari Inzer this graphic diary highlights Japanese culture and landmarks through a teenage perspective. This book not only takes you on a trip with Inzer, but also reflects her experiences in a very real, amusing, and reflective way. Her perspectives and trip encounters are fun and provide deeply personal details about her journey to visit family in Japan. For those interested in learning about Japan and Japanese culture this book takes an amusing, memorable and meaningful approach to both subjects. What makes this diary so effective is the way Inzer blends art and text. She not only talks about landmarks and Japanese culture, but also presents them with her own perspective. It’s clearly important for her to not only document her trip, but to also give her take on it; allowing for amusing and honest commentary that wouldn’t be provided within most travel guides. Her art is also exaggerated which in turn allows for a more exaggerated narrative. The way both the text and imagery works together allows her story to balance both mediums to there fullest, and use both as a form of expression of her viewpoints. This is definitely a great book for those looking for a fun and unique travel guide or an exploration of Japanese culture from a teenage perspective.